This student was the first to finish making her family planning bracelet! 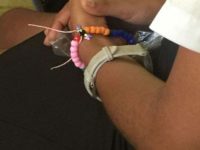 All of the girls took great pride in making their bracelets. They loved them!